Here is our retro review of Somewhere In Time, the album that almost ended Bruce Dickinson’s time in the band prematurely. 1986. The world was at Iron Maiden’s feet. The double whammy of Powerslave (1984) and Live After Death (1985) had seen Maiden conquer the globe, including the notoriously diffcult-to-break North American market. The World Slavery Tour had been a triumph, and the Live After Death double album was Maiden’s third consecutive platinum seller in the US. Make sure to check out our in-depth feature about the height of Maiden’s classic era in 1984-85! What Maiden achieved in the mid-80s is still the stuff of legend for up-and-coming bands, and it’s the shadow that Maiden themselves stood in as they set out to forge their path in the late 1980s. Everyone even remotely interested in metal music was waiting for what the biggest metal band of the 1980s would come up with next, and it’s been much-publicized that singer Bruce Dickinson had envisioned a drastic departure in style that the rest of the band and producer Martin Birch nixed. 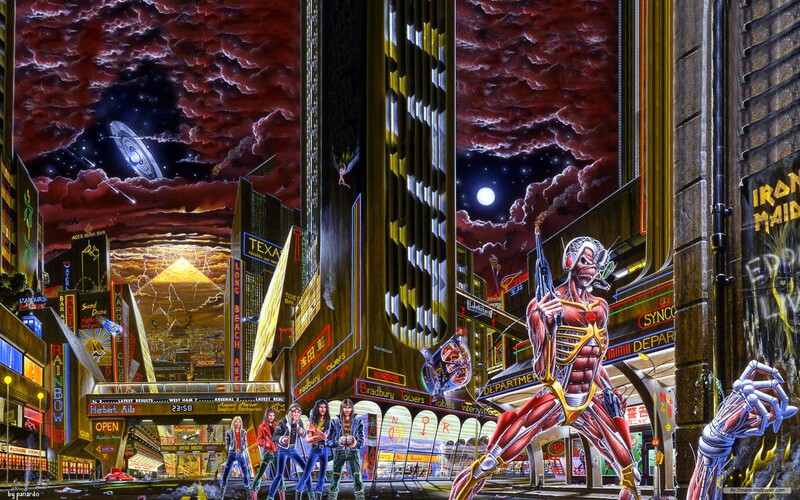 What we get instead is Somewhere In Time, a classic Maiden-sounding album without any massive stylistic shift, but not without some new and surprising elements. Time travel! Maiden riding high in 1986. The biggest change is immediately apparent: Synthesizers! Dickinson famously stated a couple of years earlier that you «can’t play heavy metal with synthesizers», but that is exactly what his own band does when they launch into Caught Somewhere In Time. The track is lengthy, and relying heavily on guitarists Adrian Smith and Dave Murray to weave soundscapes around the rather simplistic chord patterns. To a large extent, this is Adrian Smith’s album, with both his playing and his writing taking center stage like never before. Indeed, without any songwriting contributions from Dickinson, who had all his semi-acoustic songs ditched, a heavier burden rests on Smith’s shoulders to come up with both music and lyrics. 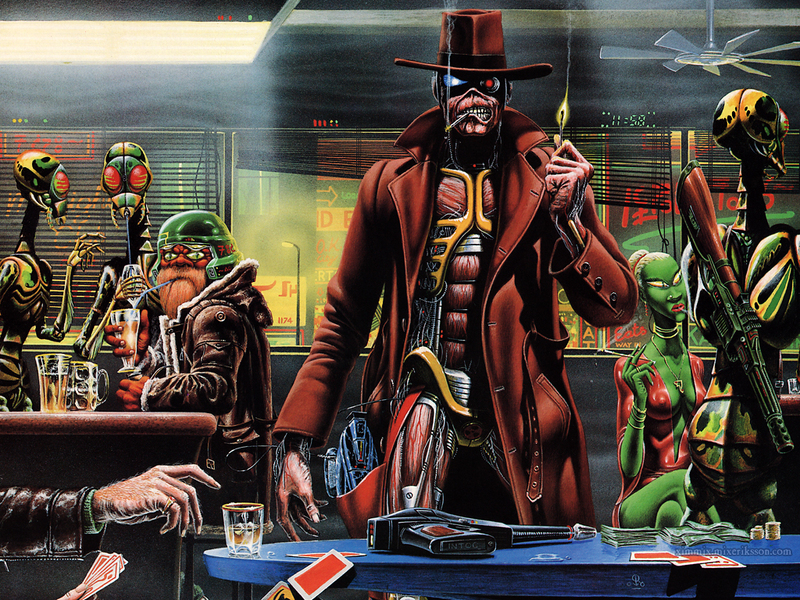 He delivers the suitably metallic Sea Of Madness, but also the brooding Stranger In A Strange Land, as well as one of Maiden’s most commercially inclined tracks ever in the form of first single Wasted Years. Eddie on his way through space and time, perhaps searching for wasted years. At the same time, Birch’s production is far removed from the bare-bones aesthetic of the previous couple of studio albums, and the more lush and layered sound sits well with the new songs. The droning synthesizers was a sign of the times, but they also suited the material. In fact, Somewhere In Time enjoys a great deal of love from Maiden fans, as guest writer Pål Ødegård elaborates on in this essay. Iron Maiden’s classic era line-up gear up for the release of Somewhere In Time, their 1986 “synthesizer album”: Dave Murray, Nicko McBrain, Steve Harris, Bruce Dickinson and Adrian Smith. On the other hand, there is material here that might have fallen through completely if it wasn’t for Birch’s skills with the knobs and faders. Heaven Can Wait is strictly filler in this reviewer’s opinion, despite the football chant that ensures its status as a live favorite. The Loneliness Of The Long Distance Runner is also middle-of-the-road, saved by some tasteful guitar work from Murray and Smith. Deja-Vu is competent rather than memorable, and Alexander The Great struggles to live up to the immense legacy of Rime Of The Ancient Mariner as it closes the record on a fine if somewhat diluted note. The standard that the band has established for themselves is obviously tough to maintain, and it’s a surprise to discover that band chief Steve Harris’ entries are actually the weakest songs on the album, with a qualified exception for the opener. Dickinson had written great things for Maiden before, and he would do so again. In a somewhat similar way Harris had written great things for Maiden before, and he would write better material than his Somewhere In Time songs for them later. Click here for our retro review of Seventh Son Of A Seventh Son (1988)! Taken as part 3 of an artwork trilogy that began with the Wasted Years single and continued with the album cover, also spinning off with the Somewhere On Tour illustration, this is Maiden and Riggs at the height of their visual storytelling, an embellishment of the music that inspired countless young bands in the 1980s. In sum, Somewhere In Time is an album that’s very sophisticated as a concept and a production, but a little less compelling as a collection of songs. Some are strong, chiefly the excellent Smith entries, while others disappoint. But even so, Maiden’s low points in the 1980s were still far better than just about anybody else’s high points. One can hardly argue with anything the band delivered in their 1982-88 period, but for this reviewer Somewhere In Time is the least great of those records, when they are put in relation to each other and not other bands. Click here for our in-depth discussion of the making of Somewhere In Time! I must desagree completely on your view on Somewhere in time album. To be short, Alex The Great is for me Maiden´s best song. Its innovative in concept and sound. If compared to Rime of the MAriner, it has a more complex and diverse arrangement with different time signatures and many different parts that fit all perfectly together. The intro gives us the sense of a marching army with a beutiful feel on the guitars and bass. Clean and drive guitars solos, drumming on the edge and a good history class on lyrics and singing. At that point the band was technically on the top of their capabilities coming from endless touring and recording over the previous years! I do not look at it as a lower quality work. But of course, it is artistically impossible to get 4 masterpieces in a row! There’s no doubt that many people disagree with me on this. As you can see from the other articles linked in this review, you’re not alone. But I would point out that I only rate it as “low” as GOOD (4 out of 6), and that is in a Maiden context. Compared to just about anything else in metal at the time it’s obviously GREAT. Add to that the fact of not having Bruce as a songwriter. Nice! If you listen to Nicko on Caught Somewhere, it is probably his greatest performance. He introduces his own doublebass ina single pedal technique and blasts completely! The whole tune it´s like an army atacking a village and leaving nothing left standing except fire and destruction! 🙂 It´s like 300% full on! It is the peak, the apex of his drumming carreer in my opinion. There was nowhere else higher he could go from that, and in fact, he kind of stabilized a bit lower on the ensuing records. I can’t believe it took me this long to discover this site. In any case, I remember when I first listened to Somewhere In Time back when I first became a Maiden fan in the late ’80s. At the time I thought it was average, but as the years went on, it grew on me. Now it’s without question one of my favorites, not just for Maiden, but for any album. The loneliness of a long distance runner has a playback problem around 2.20 mins. in the song. the sound gets strange and it seems like the song slows down for a few seconds. just like in the old days, when you tipped on the tape while in playback mode. Strange, otherwise the mastering is just perfect. Anyone got an idea about this? Interesting, Heaven Can Wait is actually my favorite song off this album. The chorus is what gets me, TBH, but I have some pretty eclectic tastes anyway, so I’m not surprised it isn’t the most popular track on Somewhere In Time It definitely occupies a weird place in between the sound of Powerslave and that of Seventh Son, as if this was the result of that difficult transition between those two sounds, the pure heavy metal sound of the former and the more progressive, conceptual sound of the latter. The end result is an imperfect product, but still very enjoyable. I can’t help but think if Bruce hadn’t gone a bit batty and had helped contribute to the songwriting, the album would likely have been a lot stronger. Good points! I always like to point out that even if I rate Somewhere In Time lowest of the 1982-88 records, it’s still one of my favorite records. Maiden in the 80s were really THAT strong. In retrospect, many writers in mags and papers in the early 90s would really bash both Somewhere In Time and Seventh Son Of A Seventh Son, to the point where the band started agreeing (in 1992 Bruce called Seventh Son a flawed record and said that they were now focusing more on the music…!) and so they went in a completely different direction at the time. Yeah, I’d imagine the direction they took for Seventh Son would ultimately be vindicated and embraced when Bruce and Adrian returned, emphasizing refinement and quality over the more raw sound they had in the early 90s. Plus, I think we can all agree Bruce sounds a lot better when he’s not raspy and guttural. @Andre: And I guess you could say that getting back to something closer to Seventh Son was what they tried with The X Factor, although I don’t like that album. I actually have yet to listen to either album from the Blaze era, given how I never see them sold in stores and I haven’t actually tried looking for them online (interestingly enough, I don’t know if I’ve ever seen a No Prayer for the Dying CD anywhere I’ve been, either). It seems most stores ignore the 90s albums altogether because of how unpopular they are. Except, of course, for Fear of the Dark. @Andre: All 90s albums are available in any digital outlet were Maiden is available, like Spotify. If you want CDs they should be easily available through stores like Amazon. But we sure can’t blame physical stores for not stocking albums that don’t sell, and the Blaze era records are certainly Maiden’s worst sellers. Alexander is as great as 82-88 composing certainly!